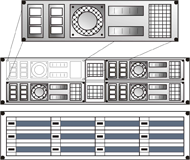 The first two stages of the ICAMS compute cluster “Vulcan” were installed in 2009 and 2010. 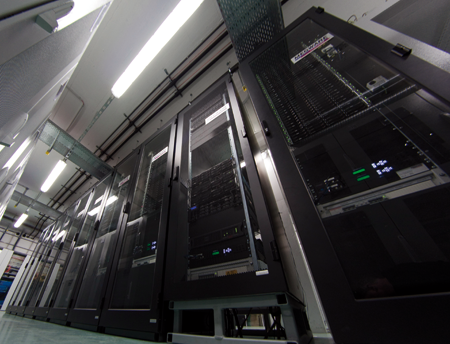 Since the installation of its third stage in April 2013 385 nodes with more than 4500 cores are dedicated to multi-scale modelling of material properties and material design. Vulcan was the ancient roman (greek: Hephaestus) god of technology, blacksmiths, craftsmen, artisans, sculptors, metals, metallurgy, fire and volcanoes. As the son of Jupiter, the king of the gods, and Juno, the queen of the gods, Vulcan should have been quite handsome, but baby Vulcan was small and ugly with a red, bawling face. Juno was so horrified that she hurled the tiny baby off the top of Mount Olympus. Vulcan fell down for a day and a night, landing in the sea. Unfortunately, one of his legs broke as he hit the water, and never developed properly. From the surface, Vulcan sunk like a pebble to the cool blue depths where the sea-nymph, Thetis, found him, took him to her underwater grotto and raised him as her own son. Late in his childhood he found the remains of a fisherman’s fire on the beach and became fascinated with an unextinguished coal, still red-hot and glowing. Vulcan carefully shut this precious coal in a clamshell and took it back to his underwater grotto and made a fire with it. On the first day Vulcan stared at this fire for hours on end. 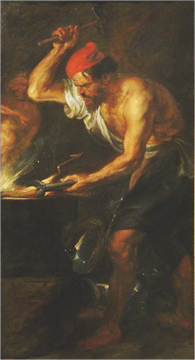 On the second day, he discovered that when he made the fire hotter with bellows, certain stones sweated iron, silver or gold. On the third day he beat the cooled metal into shapes: bracelets, chains, swords and shields. Vulcan made pearl-handled knives and spoons for his foster mother, he made a silver chariot for himself and bridles so that seahorses could transport him quickly.